Once a term, or thereabouts, we used to get handed leaflets at school from The Puffin Book Club. Â I always used to look forward to this as the leaflet contained a stack of different books with something to please everyone. Â I’m sure Mum used to groan whenever she saw me run out of school waving the leaflet in her face, as it meant I was then going to harp on about ordering a book from it for the next week or so. The Puffin Book Club operated both at primary and secondary school levels, obviously featuring different leaflets for the different age groups, and it was a great way of finding a new book that you may not otherwise have known about. Â Of course all the books were ones published by Puffin Books (the childrens arm of Penguin Books) but that was fine as they had a great range of books available. So after choosing my book and persuading Mum to buy it for me, I took the completed order form into school, and so began the wait for the new book to arrive. Â Every day I would go in expecting the books to be available, only to be disappointed. Â Eventually, after what seemed like months (it was probably only a couple of weeks) the books arrived and the teacher handed out everyones orders. Â To this day, I still enjoy getting a new book, whether as a gift or bought for myself, and if they are in unopened pristine condition then so much the better. Â Only trouble is I then hate to open them for fear of creasing the spine! I also remember another book club operating at primary school, but I can’t remember what it was called. Â This one was slightly different in that the school hall was filled with shelves containing various different books, and you could go in after school and buy a new book there and then, which was instantly more gratifying as you didn’t have the long drawn out wait for your chosen book to arrive. Barratt’s Sherbet Fountain is a classic sweetie that’s been around for years and is still available today. Â Sherbet is a sweet white powder that fizzes on the tongue, and the Sherbet Fountain consisted of a cardboard tube full of the stuff, with a length of liquorice stuck inside which is what you were supposed to eat the Sherbet with. Â The idea was to lick the liquorice, then dip it into the sherbet. Personally, I hate liquorice, so I used to give the liquorice away to whoever wanted it, then tip the sherbet into a bowl and eat it with a spoon. Â Yum! Â That’s why the Sherbet Dip Dab was really more suited to my tastes, as I preferred the strawberry lolly. Having said that though the old Sherbet Fountain still has a place in my heart for its packaging. Â A strip of cardboard was bent into a tube and wrapped with some yellow and orange paper. Â The tube was filled with the liquorice and sherbet, and the end of the paper pushed in to seal the tube, leaving the stick of liquorice poking out the end. Â This made the sweet look like a firework or a cartoon stick of dynamite, so you could get a good few minutes worth of fun pretending to blow things up before you got tucked in. Only trouble is, Barratt’s are switching the classic packaging that’s been around for donkeys years to a new plastic tube. Whilst it looks pretty much the same there was always something comforting about that old paper and cardboard wrapper, and besides, surely paper is better for the environment than plastic? In an attempt to right this wrong our favourite online sweetie shop, A Quarter Of, have set up a page where you can vote on whether or not you like the new packaging. Â In the name of all that’s good and pure I implore you to lend your support to their campaign! Â The following link will take you to the voting page, and whilst you’re on the site, why not pick up a few Sherbet Fountains for old times sake! Now I have to admit I never really watched MacGyver, which I find amazing since its the kind of show that would normally be right up my street. Â I think it was probably because it was on at an awkward time for me, because if memory serves me right it was shown early Saturday evenings whilst we were having our evening meal. Â Apparently the show ran for 7 seasons but I don’t remember it being on that much in the UK, so I’m guessing we never got to see every episode? Another reason I would expect the show to appeal to me is that the title role of Angus MacGyver was played by Richard Dean Anderson, better known to me as Jack O’Neill from Stargate SG1. Â I really like Jack in SG1, so I’m sure I would like MacGyver, although it worries me slightly that two of MacGyver’s biggest fans are Patty and Selma Bouvier, the sisters of Marge Simpson. Anyway, to the show itself. 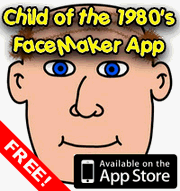 Â Angus MacGyver was a secret agent working for the Phoenix Foundation, who was sent in to solve various types of situations in as non-violent a manner as possible. Â Unlike Jack O’Neil, MacGyver never carried a gun, but was armed with his trusty Swiss Army Knife, a tool which came in very useful at various points during his adventures to help him build or kinds of gubbins and thing-a-me-bobs out of every day objects. Â A bit like the A Team, MacGyver could have created a laser out of a torch, some toffee papers, two elastic bands and an old newspaper. 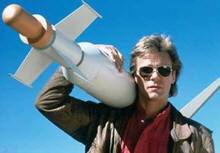 MacGyver’s ability to make something to get himself out of tricky situations soon became used in the series by other members of the cast to explain to others how they had got out of a scrape. Â “Oh, he MacGyvered a solution” was all that needed to be said for people to know that the impossible had been achieved. Â This phrase was even used by Sam Carter in an episode of SG1 as a little tongue in cheek nod to Richard Dean Anderson’s past role. The show ran from 1985 to 1992 and also spawned a couple of TV movies, Lost Treasure of Atlantis and Trail to Doomsday. Â There are currently plans for a new big budget film, but whether Richard Dean Anderson will return to the role of Angus MacGyver is not yet certain. Â In the meantime, here are the opening credits to the show, where you can marvel at the size of MacGyver’s amazing Mullet hair style. Â Maybe that’s where he kept all those objects he used to make his gadgets? Brushing your teeth every morning is of course vitally important for a healthy smile and using a good fluoride toothpaste is a mustÂ (and I’m not just saying that because I’m married to a Dentist). 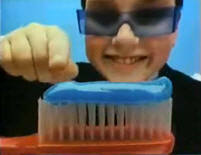 Â As a kid though I always disliked brushing my teeth for two reasons. Â One was that I found the mint taste to be a little too strong for my liking, and the other was that drinking orange squash afterwards made it taste funny. The answer to my prayers was the launch of Colgate Blue Minty Gel. Â Most toothpastes are just that white opaque paste, but some have stripes of colour running through them (just how does that work – ’tis witchcraft I tells thee). Â Colgate realised that these coloured stripes were much more fun so made a toothpaste that consisting entirely of stripe (if you see what I mean). Colgate Blue Minty Gel was a slightly translucent jelly like substance that was bright blue in colour. Â Its minty taste was a lot milder than most toothpastes and it was a lot more pleasant to brush with because of that, plus it was blue! Why did it only answer half my prayers? Â Well, it still made orange squash taste funny if you drank it too soon after brushing, but then that happens with anything that tastes of mint. Which was your favourite event in Daley Thompsons Decathlon? And my worst event? Â Definitely the 1500m (if I managed to get that far). Â Far too much joystick waggling or keyboard bashing, and I still invariably came last. Â Which was your worst event? Which was your least favourite event in Daley Thompsons Decathlon? KP Outer Spacers were corn and wheat based puffed snacks, similar in many ways to the more instantly recognisable Monster Munch. Â As with Monster Munch they came is similarly strange flavours, these being Beefburger, Chutney and Pickled Onion varieties, but unsurprisingly had a more science fictiony theme in their shape. Each flavour was represented by a different type of spaceship which appeared on the front of the packet but was also the shape of the crisps themselves, so we were treated to strange rings which were meant to be space stations, and triangular things that were meant to be rockets. Â The shape ultimately didn’t matter of course, because they tasted nice and after all thats the main purpose of any snack, isn’t it? 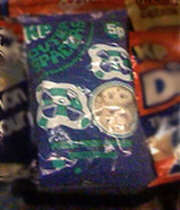 They are sadly no longer available but over the years there have been similar crisps available under different names. Â There were Alien Spacers and Space Raiders (both of which I think may still be available today) and I’ve certainly seen something called Transform-A-Snack recently, which appears to be different shaped crisps that you can slot together under the premise of making robot shapes. Â At least that’s the impression I get, having never actually bought a packet of them. 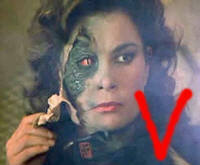 I remember being very excited when I first heard about the original V mini-series. Â I was 10 at the time and they kept playing adverts for it with lots of spaceships in so my curiosity was peaked. Â The only trouble was that it was going to be shown late at night (which was probably only 10pm, but to a 10 year old that was late) so I begged Dad to set the video recorder up for me so I could watch it, which he did. So we settled down to watch the first episode and sure enough there were loads of spaceships. Â Massive ones which came to rest over all the big cities in the world, illustrated as you might expect with a thumping great flying saucer hovering over some famous world landmarks. Â The aliens make their first appearance, and things were a bit disappointing. Â The aliens may have been dressed in bright red jump suits but they were depressingly human. Â They did have strange sounding voices though, so I kept watching. The early 1980’s were a golden time (pun intended) for UK athletics with many great athletes hailing from good old blighty winning gold medals at the Olympics and other sporting events. Â One of the greatest was Daley Thompson, or Francis Morgan OyodÃ©lÃ© Thompson CBE to give him his full name and title. 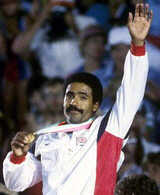 Daley Thompson was born in London on 30th July 1958. Â He represented the UK in the Decathlon, which consists of ten events – 100m, 400m and 1500m races, 110m hurdles, high jump, long jump, pole vault, discus, javelin and shot put. Â As you can imagine in order to do well in the Decathlon you need to be incredibly dedicated as there’s an awful lot of training to do! He was always instantly recognisable with his trademark moustache and wide grin, although his sense of humour sometimes got him into trouble when he made somewhat inappropriate remarks at times, such as asking Princess Anne if she would have his babies or wearing a T-Shirt with the slogan “Is the worlds second greatest athlete gay?“, an attack at one of his rival competitors. Â He also famously whistled the national anthem whilst stood on the Olympic podium.